A new era in my jewelry making begins! I have, for some time, wanted to do some prong setting of faceted gems. I love the sparkle of faceting, and while I love cabochons, I also like a more "open" setting at times. But prong setting is not as easy as it might seem. It takes a great deal of patience and restraint, or you can find yourself with a ruined setting, a cracked gem, or both. Say hello to the first of my new line of prong set earring studs. Simple, classic, everyone loves a good set of post earrings, and I loooooove how they sparkle! 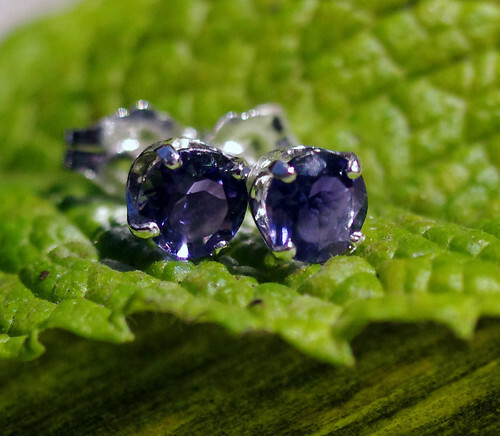 These are 5mm Iolite faceted gemstones. Or, the equivalent of 1/2 carat earrings in sterling silver and genuine, natural stones. Aren't they gorgeous? I'm so excited! This opens so many new doors of jewelry making opportunity for me. I plan to offer a whole line of these in my store, with various stones and sizes. I can also set them in 14K gold, but those are a bit more expensive, so I'll probably offer them on a special request basis. More photos and info at my Etsy store.